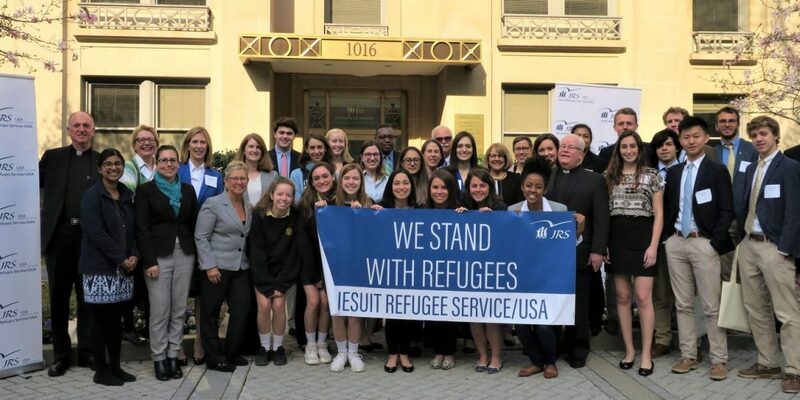 On Thursday, April 4 the Jesuit Refugee Service/USA welcomed a group of over 50 participants for its annual Advocacy Day. Advocates represented 15 states, the District of Columbia, and 30 Congressional Districts and met with 51 Congressional offices, including member meetings with Senator Sherrod Brown (D-OH) and Rep. Anthony Gonzalez (R-OH). During the meetings, advocates discussed three key policy issues that could make a significant and lasting difference in the lives of refugees. These were, FY20 federal funding for humanitarian assistance and refugee education; humanitarian assistance to Venezuelan refugees and migrants; and refugee resettlement. In preparation for their meetings on Capitol Hill, advocates took time to strategize and determine their approach for each Member of Congress they were to meet. The participants’ knowledge of the topics allowed them to work together to deliver a strong message on behalf of the more than 68 million forcibly displaced persons around the world. Advocacy day opened my eyes to the fact that contrary to popular opinion, young people in this country DO have a voice in politics and can make a difference if we truly apply ourselves and especially if we observe the example that organizations such as JRS set for us. Advocacy Day participants represented individuals who support refugees and have a connection to the mission of JRS. This included students from Gonzaga College High School and Georgetown Prep, along with other Scholars from Georgetown University and John Carroll University who are currently taking international peace and justice classes focused on global migration. JRS/USA staff, Executive Board members, and the JRS International Director, Fr. Tom Smolich S.J. also joined advocates during their Capitol Hill meetings. Truly an impactful experience and gave me a sense of fulfillment and hope on a cause that is often filled with bleak outcomes. JRS/USA’s Advocacy Day on Capitol Hill was a wonderful opportunity to take an active role in speaking out on behalf of refugees and other forcibly displaced persons both around the world and here in the U.S. Don’t miss JRS/USA’s next Advocacy Day, set to take place in April 2020.